We were delighted to open the post this morning to find a letter from Sam Gyimah MP, the Parliamentary Under-Secretary of State for Childcare and Education. 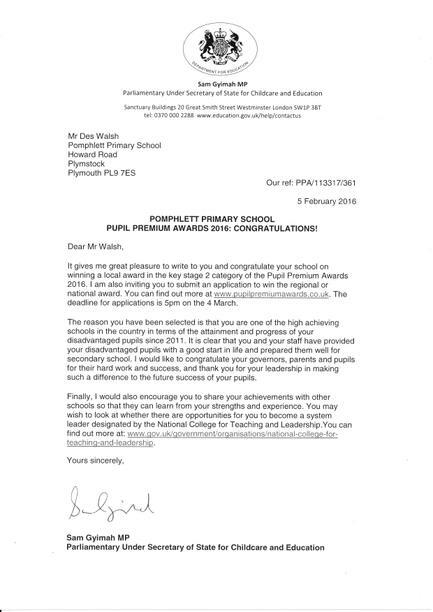 Mr Gyimah wrote to me to congratulate the school on winning a local award for the Key Stage 2 category of the Pupil Premium Awards 2016! The Pupil Premium is additional funding for publicly funded schools in England to raise the attainment of disadvantaged pupils and close the gap between them and their peers. Schools in England receive funding for each child registered as eligible for free school meals at any point in the last six years along with children who have been in the care of the Local Authority. Mr Gyimah informed me that the reason for us having been selected for this award is that we are one of the high achieving schools in the country in terms of attainment and progress for our disadvantaged pupils since 2011! He congratulated governors, parents, pupils and staff for our hard work and said that it was clear we provided disadvantaged pupils with a good start in life and prepared them well for secondary school. He also invited us to submit an application to win a regional or national award! The full letter is reproduced here for you to see. This is a coveted and prestigious award, which we came close to winning last year, so it is very pleasing to have our work recognised in this way this year. Well done to everyone who has contributed to this success!